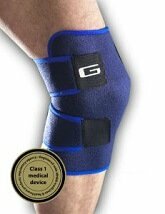 Elastic knee braces and supports can be a really helpful tool if you are suffering from knee pain. They are really simple to use, cheap and provide some support and warmth to the knee. Whether you have suffered a minor knee injury or sprain, or have ongoing knee problems, an elastic knee support can help to reduce pain and instability. They are also great to have in the cupboard for those inevitable knocks! Here, we start by looking at how they work and what conditions they are most suitable for, then we compare the different basic elastic knee braces on the market and help you find the best one for you. We will look at how they differ from each other and you can use the size guide to help you get the perfect fit for you. They are not suitable for moderate to severe instability and pain – in these cases you need advanced or elite protection. Overview: Made of anti-slip silicone and with 4-way stretch capability this sleeve offers superior protection. It is ultra lightweight combining comfort, flexibility and support. Designed for optimal compression grade to improve muscle endurance, protect the knee and enhance recovery. Available in three sizes S, M, L.
My verdict: This is the top selling knee sleeve on Amazon and it receives amazing reviews. It's design means it stays firmly in place unlike many cheaper knee sleeves. Currently only available in the US. Average user rating 4.8/5. 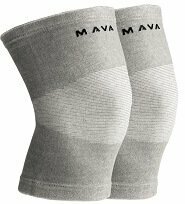 Overview: The Mava compression sleeve provides support and compression, increasing circulation to the knee and relieving pain. Made from breathable, moisture-wicking, antimicrobial material, it is suitable for everyday wear. Sold in pairs and available in grey or black and in four sizes. My verdict: Mava elastic knee braces are extremely popular and come with a 30-day money back guarantee. They are good value as you get two sleeves in the box, perfect if you need one for each knee, or so that you have a spare for when washing etc. Average user rating 4.5/5. Overview: This Neo G brace improves stability by eliminating unwanted gliding and twisting at the knee. The brace ensures that the weight through the joint is evenly distributed, which helps ease pain. It features an opening at the front with a stitched buttress giving reinforced support to the patella and anterior knee. This brace is a Class 1 medical device registered with the Medicines and Healthcare products Regulatory Agency. My verdict: This is my favourite open knee design basic brace. Some people prefer open patella braces like this as they give better support to the kneecap without putting pressure through it. They also allow the leg to breathe better so get less sweaty. Average user review 4.4/5. Overview: A popular pull on sleeve providing basic support. It is sized and shaped to ensure it fits well, which is something you don’t always get with cheaper brands. It is also seamless behind the knee for extra comfort. Provides compression and retains warmth to promote healing and reduce pain. Fits left or right leg and comes in five sizes. My verdict: This popular elastic knee brace is excellent value for money and is my favourite closed knee sleeve. It is easy to apply, stays in place and is made of heavy duty material so is long lasting. McDavid is a trusted brand worldwide so you can’t go far wrong. Average user rating 4.4/5. Overview: This Neo G elastic knee brace provides compression, support and warmth to the knee without restricting movement. It is only 2.5mm thick so can easily be worn under your clothes, providing support whilst still allowing full movement. My verdict: This wrap around elastic knee brace provides good basic level support and actually stays in place, unlike many other knee braces. 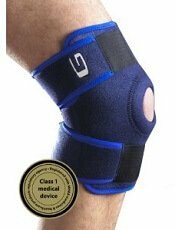 Reviews are extremely positive however if you have problems with your kneecap, the Neo G open sleeve above may suit you better. Average user rating 4.3/5. Overview: This black pull-on sleeve combines superior stabilization with the benefits of heat retention. It is made of elastoprene – an innovative combination of breathable elastic and neoprene blend materials. This provides support and retains heat to help reduce swelling and aid healing, whilst releasing moisture to prevent excess sweating. Has comfortable reinforced edges which prevent rolling and slipping. Available in sizes Small/Medium 11-15" and Large/Extra Large 16-20”. 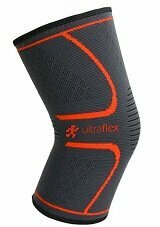 Overview: A popular pull on knee sleeve providing compression and soft tissue support. This model features a hole and buttress at the front to reduce pressure on the patella, improving comfort and flexion. Made of neoprene, it retains heat to reduce pain and promote healing. It has an inner rubber surface reduces slippage and is seamless behind the knee for extra comfort. Has the added advantage of bring Latex-free. My verdict: People report that is very comfy even when worn all day. It comes in a reversible black/red. Average user rating 4.1/5. 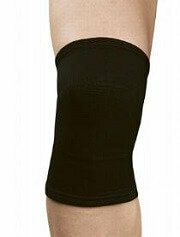 As you will see, there are three types of basic elastic knee brace: full closed sleeves, open sleeves and wrap around knee supports. Let's look at the pros and cons of each style. Why Choose this Type? A full sleeve provides support all around the joint and retains heat well. They are very simple to use – just pull them on and you’re ready to go and they are perfect for people who get niggles when doing activities. These are generally the cheapest types of knee support on the market. Why Choose this Type? 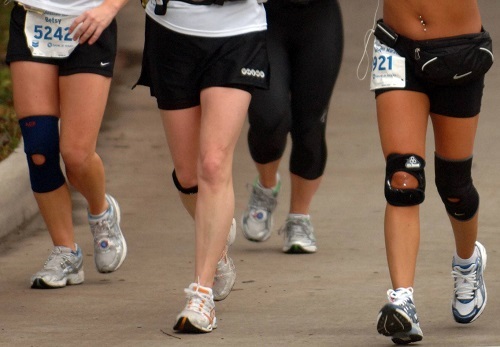 This style of elastic knee brace has a hole and support buttress at the front. This reduces the pressure on the patella which can be helpful when there is pain at the front of the knee e.g. from Runners Knee or Chondromalacia Patella. Again, they are extremely easy to use – no Velcro straps to worry about. Why Choose this Type? Wrap around elastic knee braces have adjustable straps so you can fit them to your own unique shape. This makes them particularly useful with the changing sizes of swollen knees. Some are open at the front for the patella (putting less pressure through it and allowing the knee to breathe) while others are closed all the way round. They are really easy to get on and off – you don’t have to pull them up your leg and they often tend to stay in place better than pull up sleeves. They are one size fits all so you don’t need to worry about choosing the right size. A lot of it comes down to personal preference when choosing a knee support. I personally prefer wrap around elastic knee braces with an opening at the front as I find they tend to stay in place slightly better and don’t put pressure through the kneecap, which is a common cause of pain. But other people prefer having a sleeve to pull up so they don’t have to contend with Velcro! Choosing a knee brace can be difficult, especially as there are so many different ones on the market. If you are experiencing moderate knee pain or are looking for a bit more support than these basic elastic knee braces and supports can provide, you would likely benefit from an advanced brace. If you have had a serious injury and need maximum support, you will need an elite level brace to provide you with adequate support and prevent further injury. To find the best brace for you, visit the brace guide to find out about the different styles of brace available and what conditions they are suitable for. We also provide recommendations on star buys based on the opinions of people just like you. Where elastic knee braces come in more than one size, it is important to get the right one otherwise they won’t work effectively and may be very uncomfortable. 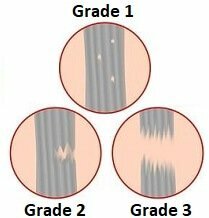 Measure around the widest part of the knee and choose from the options below. If your knee size falls between two sizes, it is usually best to go for the larger size for a better fit.